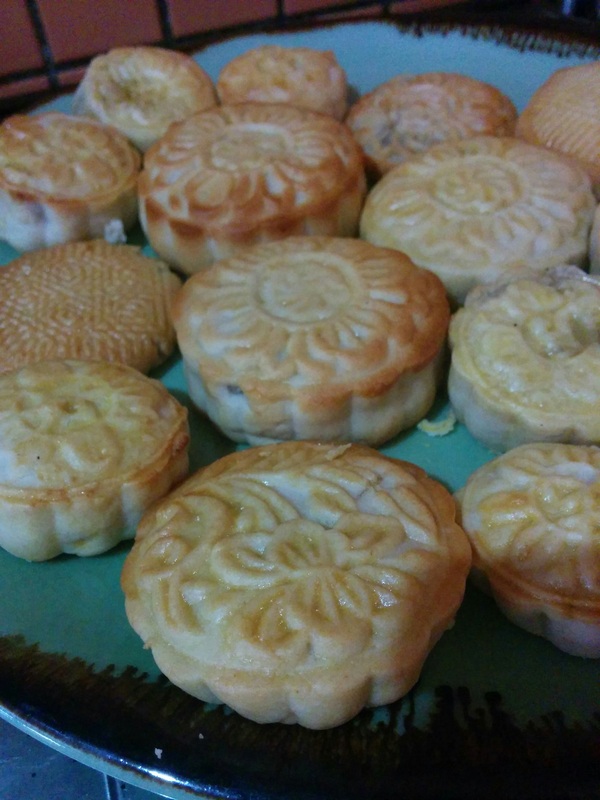 I’ve always been curious to try making our own mooncakes, and this was the year the stars aligned for me to try it. Mooncakes seem like the type of thing you can only buy from a bakery or store, but–happy news!–you can make them yourself. And it’s not really that difficult. 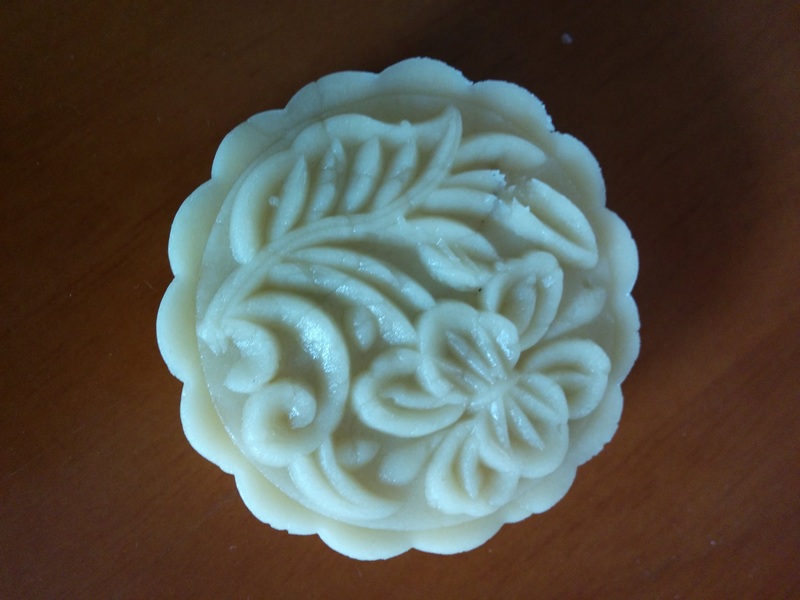 I got molds on Taobao (where else?). One regular size, one miniature size, each with a few different pattern plates. If you are in the States, you can get the molds on Amazon…but for a lot more than they cost in China. No one is surprised. I looked at a few different recipes online and settled on this one from Food 52. There were other recipes in Mandarin, but for this first time, it seemed easier to have the process explained to me in my mother tongue. Lotus seed paste mooncakes are probably my favorite (red bean paste and wu ren are also contenders for the top spot), and that is exactly the filling used in this recipe, which was a nice bonus. 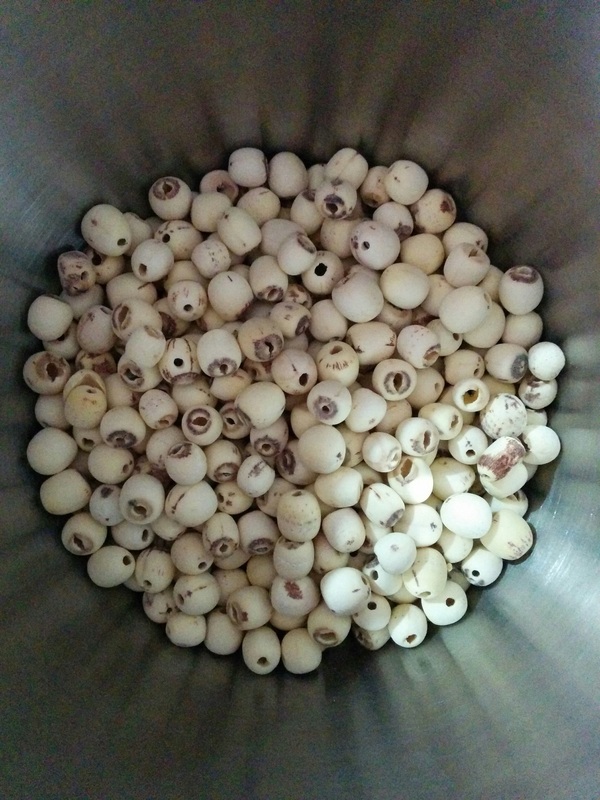 First, I prepared the lotus seeds. 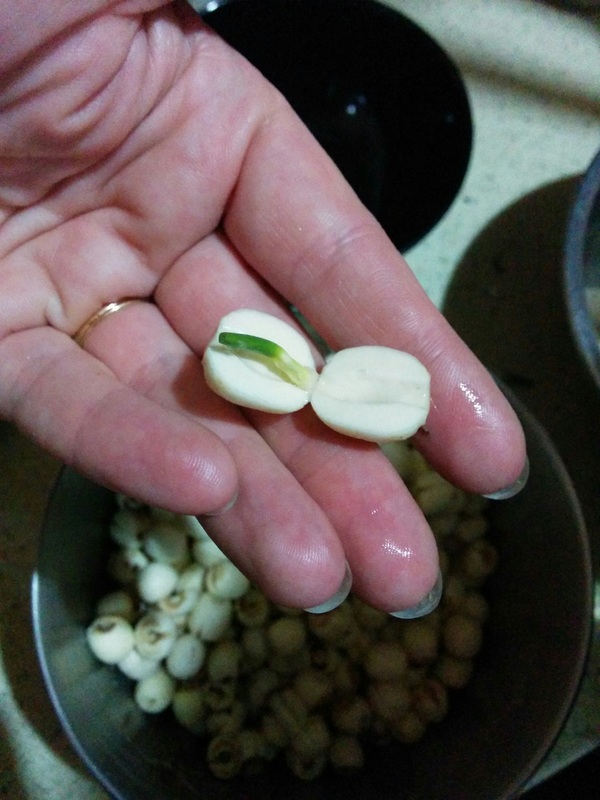 They are sold as dried seeds and look like this. Soak overnight, then split and remove sprouts. So far, so good. Now just a couple hundred more steps to go! Somewhere in this 2-day process, my friend posted on Facebook something about pre-made lotus paste. Drat. That would have been easier. The benefit of homemade, though, is that you can control the sweetness. And you don’t risk eating something that will turn out to be part of the next Chinese food scandal. And honestly, making the paste was not that hard. It’s just that some of the steps take a lot of time (like soaking for 6-8 hours) so you have to plan accordingly. For the dough, I used honey instead of golden syrup, and just stirred a bit of baking soda in water for the “kan sui.” I live in China and could probably get the real ingredients, but I am lazy. The substitutions seemed to work fine. The fun part was having our whole family assemble and press the mooncakes. It’s actually simpler than I expected, possibly because we were just smashing the dough instead of rolling it out properly. 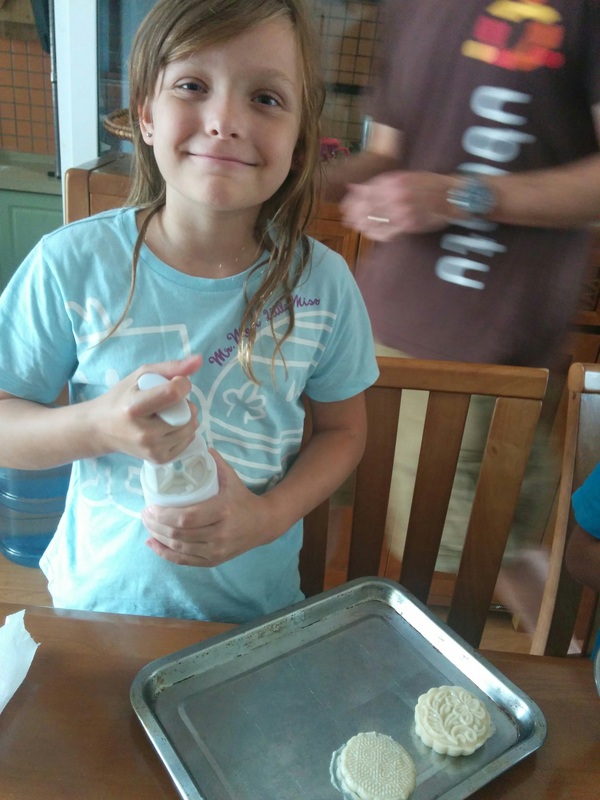 Even more fun than making sugar cookies! 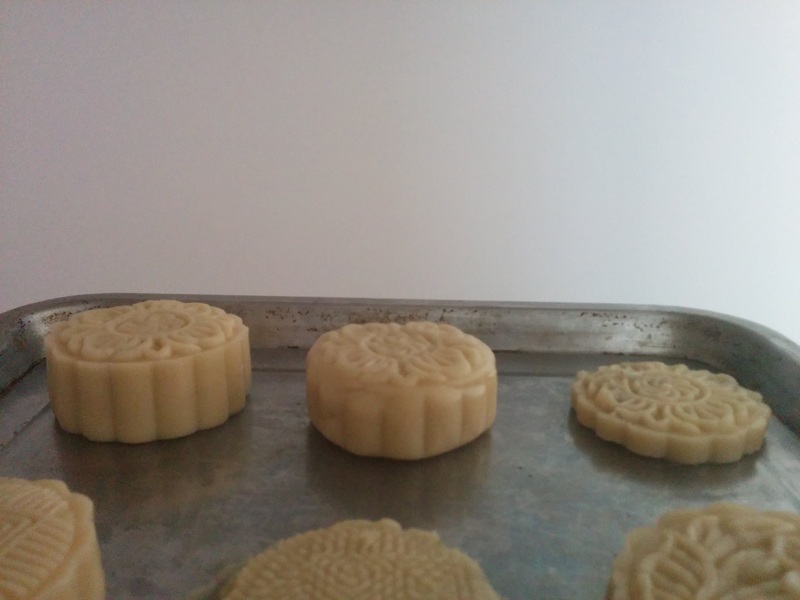 We found it easier to press the mooncakes directly onto the baking pan. You’re really supposed to weigh the balls of dough and probably the filling, too, to ensure consistent sizes. We did not. 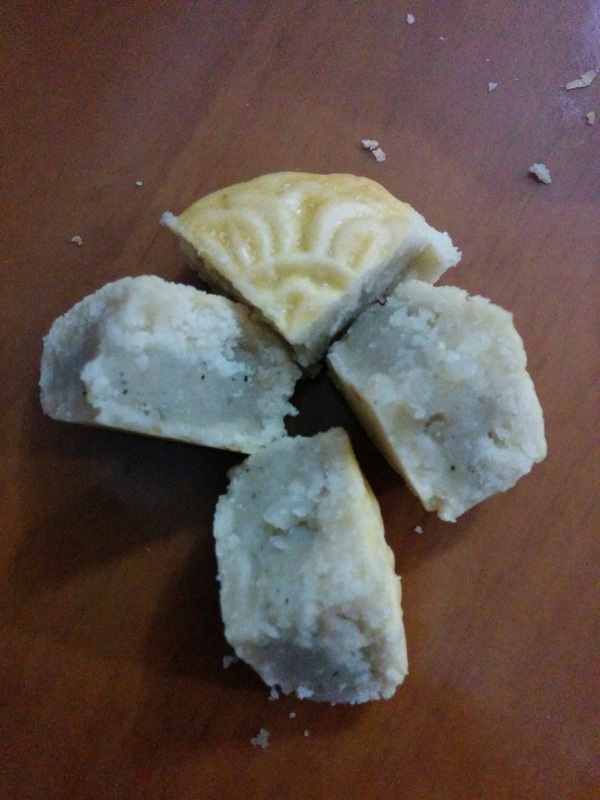 I tripled the recipe, and we ended up with 7 regular size and 7 miniature mooncakes, and tons of filling left over. Your results will undoubtedly vary since you are way more likely to actually aim for standard sizes. Since we made these the morning of Mid-Autumn Festival, we did not store them for two days before eating, as you are supposed to. They were still really good. 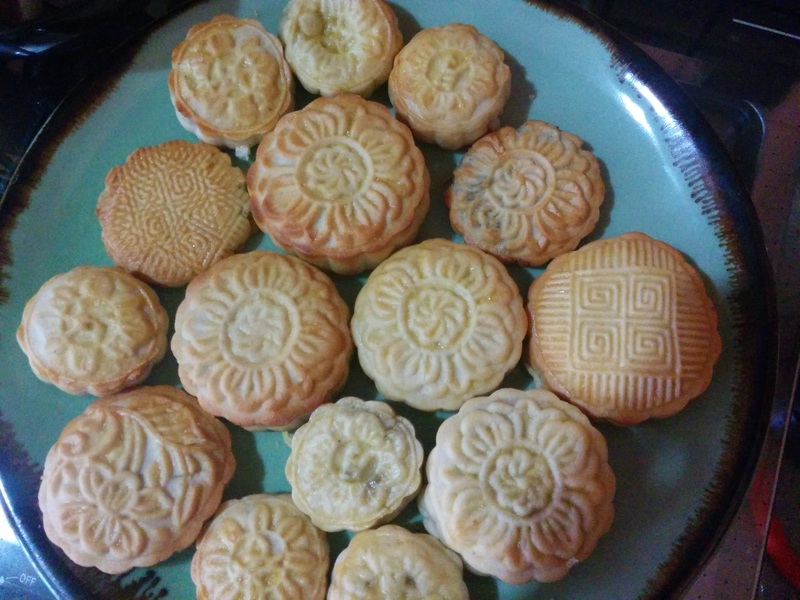 We were all very pleased with the results, and pretty darn proud that we made mooncakes! 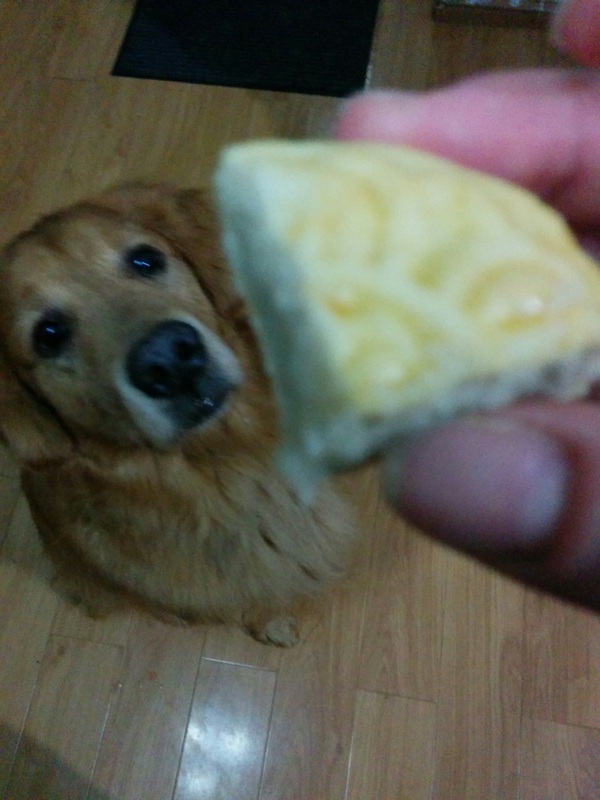 Here’s what happens when you hold a piece up to get a clearer picture but you have a golden retriever. Lard instead of local shortening. 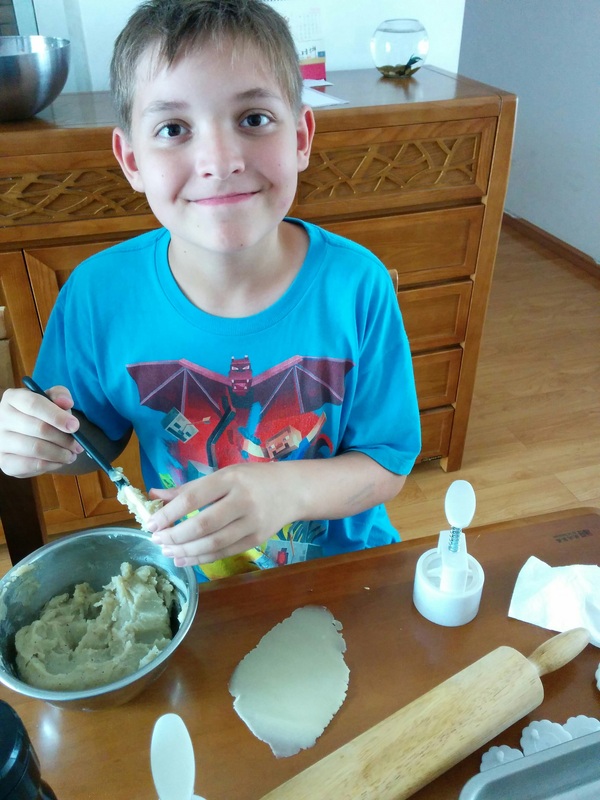 Attempt red bean paste and wu ren fillings in addition to lotus seed paste. Make MORE. We heart mooncakes. Probably make more of an effort for consistency, though my friend pointed out that the varying sizes made it charmingly obvious these were homemade. Make them ahead of time. The crust was a little too stiff, and the recipe says that letting them sit is how you get a “soft and supple” crust. Not feed any to the dog because they are really bad for him and give him horrendously foul gas. I didn’t think the honey and baking soda water noticeably changed the taste or texture of the dough, and those are ingredients we always have on hand. So, I will continue my lazy ways and not look for the the proper things next time. So, there you have it, folks. 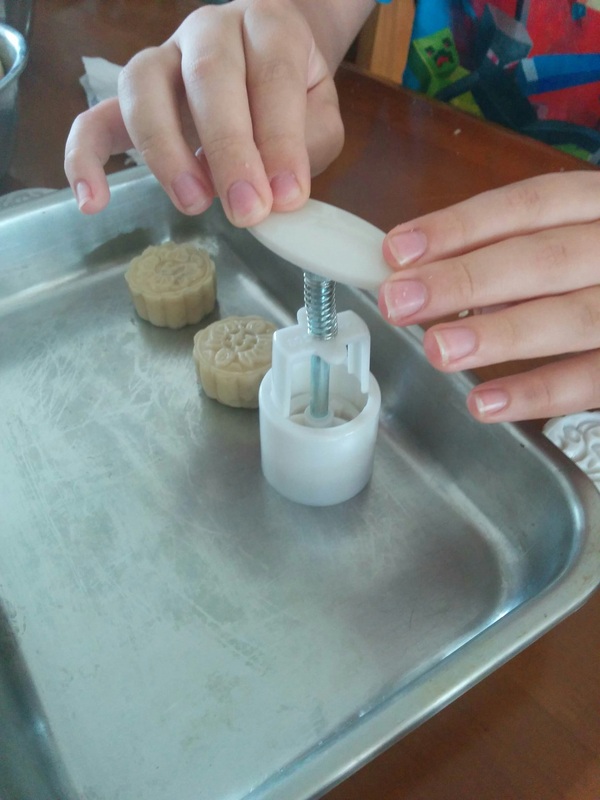 DIY mooncakes are possible! No matter how you got your mooncakes this year, I hope you enjoyed them and had a wonderful Mid-Autumn Festival! Sorry, Americans. No fruit mooncakes for you. Hmm, to go to 99 Ranch or to go the do-it-yourself way including removing the sprout from the 100 beans. Maybe 1st time in my life I am passing up the challenge of DIY. Wondering when I would first notice old age. I think this may be it! I’m about two years late, but these are SO GREAT!!! They look incredible! So, so happy that they turned out for you. That’s okay! Yes, we were really happy that they turned out. Thanks for commenting!